Welcome to St. Matthew’s Primary School website which aims to give you a taster and insight of life in our vibrant school community. 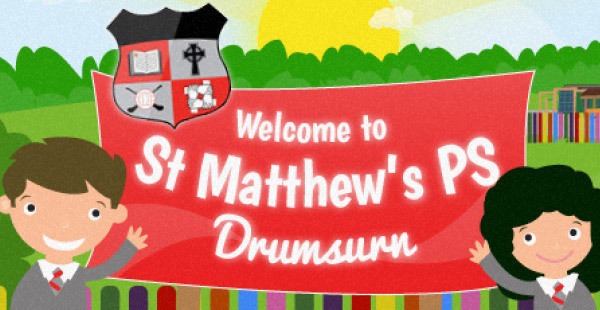 St. Matthew's is a maintained Co-Ed Primary School situated in a beautiful, idyllic setting in Drumsurn. Our school is bright, spacious and very well equipped both inside and out. We have an excellent reputation for high quality teaching, hardworking and friendly pupils where the child is at the centre of everything that we do. We have a dedicated and caring staff who will support you as parents as we journey together to ensure that your child’s primary education will be a rewarding and enjoyable learning experience. We are a happy, caring school that works in partnership with all our parents and the parish community to ensure that our children make the most of their potential in academic, religious and personal development. We are committed to inspiring a love of learning through stimulating and engaging opportunities in an inclusive environment. This website is one of the ways we communicate with members of our school community about what is going on in our busy school. We trust you will find our website helpful as it will give you an overall impression of what makes our school so special.As our website can only give you a flavour of what our school is like and you are interested in finding out more, please come and visit us in person, you are assured of a very warm welcome.